The era of tax exemption in UAE is over now thanks to the continuous fall of oil and petroleum prices in international market since 2014. The effect is most prominent in GCC countries and UAE is one among them where the governments are finding it difficult to retain the same level of tax free economy that was during the time of high prices of oil and petroleum products. An example is the Excise tax that was imposed few days ago by UAE and Saudi Arabia and both these countries have also announced to implement value added tax (VAT) from 1st of January 2018 at a standard rate of 5%. VAT will also be imposed by other GCC countries later in the year 2018. VAT is somewhat similar to Sales Tax as both are indirect taxes that are applied on transaction of goods. But VAT is difference from sales tax in the sense that sales tax is only applied on the final sale of products to the customers while VAT is applied on both goods and services and it is charged throughout the supply chain. In order to support domestic providers of goods and services, VAT is also levied on imported goods and services. 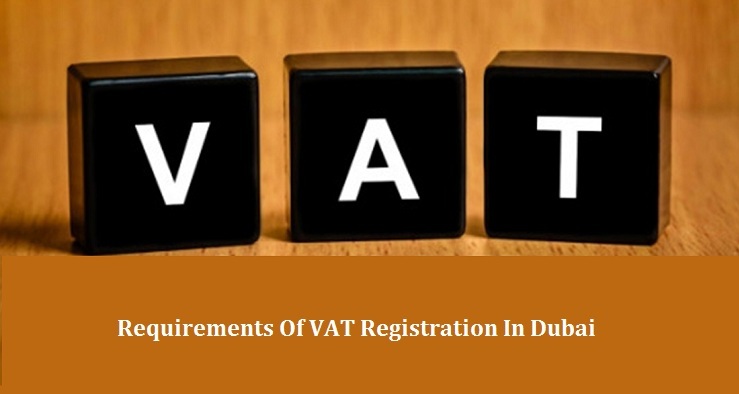 The online registration of VAT has started in Dubai and also in the other emirates of UAE. The registration is mandatory for businesses with annual turnover of AED 375,000 or more while the Federal Tax Authority (FTA) has also advised the businesses with annual income of more than AED 187,000 to register them if they want to. Large businesses with annual revenue of AED 150 million can register by 31st October 2017 while businesses with annual income of AED 10 million can register by 30th November 2017. VAT is applied on businesses of individuals, government authorities and companies that surpass the mandatory annual turnover of AED 375,000. The procedure of VAT registration can be followed on the official site of Federal Tax Authority (tax.gov.ae). After online registration, the applicant will deposit required fee and submit all the necessary documents after which the authority will issue the ‘tax registration number’ to the applicant. An individual is required to submit documents including a photocopy of applicant’s passport, valid permit of residence and request letter signed by the applicant. In case of a government authority, the required documents are copies of act of incorporation and decree. If you are a registered company in Dubai then you will need to submit photocopy of valid trading license and a request letter signed by the company’s authority. Apart from these specific documents, few other documents will also be required including: trade license, bank account details, articles of association etc. Thank you for sharing informative article. Everyone need this info in Dubai. Thanks for the informative article about VAT. Nowadays, many peoples like me really confused on VAT implementation. However, after reading your post some of my questions are clear and ready to move.